In the early days of the Internet users would type an IP (Internet Protocol) address into their browser to visit a website. An IP address is made up of 4 groups of digits such as 123.45.678.90. People found it hard to remember IP addresses so domain names were developed to allow the use of easily remembered words and phrases to identify IP addresses. Each domain name must be unique - no two organisations can have the same domain name. 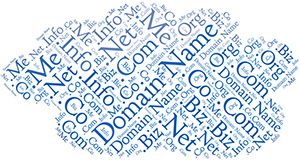 Domain names are used in URLs to identify particular Web pages. For example, in the URL http://www.mickwood.com/index.shtml, the domain name is mickwood.com. Having decided on your domain name, you then need to check whether it is available or whether it has been registered already by another user. You can use the Easyspace Checker, which is the same tool that mickwood.com uses, or you can try the new Google Domain Tool which is still in BETA. There are over 300 million registered domain names worldwide and many of the most popular names have already been taken. Verisign estimated that 1.3 million domain names were registered in Q1, 2017. As a result you may have to be creative to obtain a good domain name. We can help and advise you on getting the right name for your organisation. It is important because your visitors need to remember your name so that they can use it to find out about your organisation and services. If you have already registered a domain name and wish mickwood.com to act as your registrar you should select the Domain Name Transfer option. If you wish to change your domain name registrar from mickwood.com to another registrar there is a 'one-off' administration charge of £25.